Canadian Troops Near Belmont, South Africa by J. Cooper Mason. The South African War or, as it is also known, the Boer War, marked Canada’s first official dispatch of troops to an overseas war. In 1899, fighting erupted between Great Britain and two small republics in South Africa. (See map) The two republics, settled by Boers, descendants of the region’s first Dutch immigrants, were not expected to survive for long against the world’s greatest power. Pro-Empire Canadians nevertheless urged their government to help. The war, they argued, pitted British freedom, justice, and civilization against Boer backwardness. While many English-Canadians supported Britain’s cause in South Africa, most French-Canadians and many recent immigrants from countries other than Britain wondered why Canada should fight in a war half way around the world. Concerned with maintaining national stability and political popularity, Prime Minister Sir Wilfrid Laurier did not want to commit his government. Yet the bonds of Empire were strong and public pressure mounted. As a compromise, Laurier agreed to send a battalion of volunteers to South Africa. Over the next three years, more than 7,000 Canadians, including 12 women nurses, served overseas. They would fight in key battles from Paardeberg to Leliefontein. The Boers inflicted heavy losses on the British, but were defeated in several key engagements. 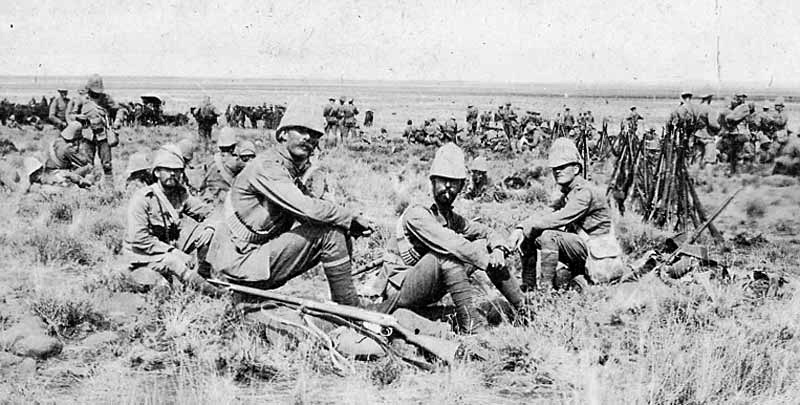 Refusing to surrender, the Boers turned to a guerrilla war of ambush and retreat. In this second phase of fighting, Canadians participated in numerous small actions. Gruelling mounted patrols sought to bring the enemy to battle, and harsh conditions ensured that all soldiers struggled against disease and snipers’ bullets.